I have left Denmark behind. With a heavy heart, but I can quote the legendary words: ‘I’ll be back.’ Already next year, because I have slightly changed my route again. I would like to go the North Cape in Norway first and than on to Finland, Russia, White Russia, Ukraine, Romania, Bulgaria back down south to Turkey. Now I am really beginning to prepare my trip. So I hope to blog a bit more regularly again. I read as much as I can about the different countries, cultures, languages etc. But also about gear and everything that comes with that. That is because I have to start from scratch, I’ve never done something like this before. Yeah, I did some camping with my mates when we were barely allowed to drink a beer. A tent, sleeping bag and camping mattress are the first things I am checking out, but there are a million other things to consider. Stove (apart from a DIY beer can stove), clothing, spare parts etc, etc. All those preparations make the trip more and more real. I am getting more and more enthusiastic by the day. 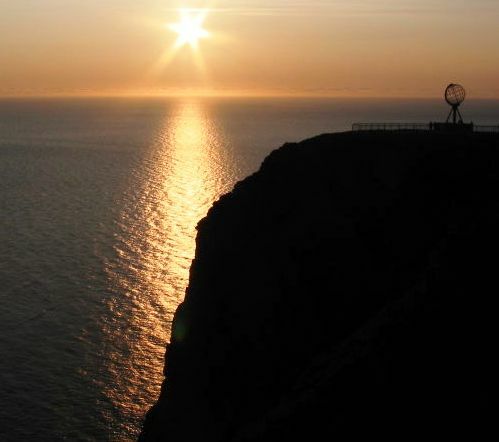 Just the thought that I will be – if all goes well – on the North Cape next year fills my heart with joy. With that I also realize there are so many things to think about. Someone gave me the advice to do a course in which you for example learn to stitch yourself. What do you do when your shoulder pops out of its socket when you fall and there is not a living soul around for miles because you’re in the middle of nowhere. Than come the doubts in play as well. Can I possibly do this? Can I truly cycle so many miles? Can I leave my loved ones behind for so long? What if if I really fall and hurt myself quite badly? What if this, what if that? But won’t there not just happen things you don’t think about? Be prepared for the most obvious things. Therefore I won’t let doubts stop me. I look at a map, I check out countries on the internet and pretend I am there and imagine what I will experience. Everything fades into a beautiful sunny day and I see myself riding away to the horizon. Just a few months waiting and some preparations and I will actually be there! What is there to doubt when you see something like this? Thus, in the coming time I will write about my preparations. As soon as I have a tent and stuff like that, I’ll go out and test it in the bitter Frisian climate.